Wouldn’t it be wonderful to be irresistible? Lovers falling at our feet, cabs pulling up beside us while ignoring the rest of the customers on the rank, waiters rushing to take our orders … That may be a fantasy, but crafting offers your clients can’t resist is actually part of your business plan, although you might not have put it in quite those terms. 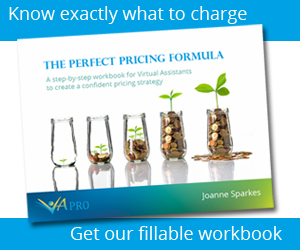 The bald truth is that unless you can persuade new clients to choose to work with you, expand your offering with existing clients so they use you more, and up-sell yourself and your services, you’ll always find it tough to thrive in the Virtual Assistant world. Creating irresistible offers is about working smarter, not working harder, so you retain your client base and grow it at a pace that works for you. Before beginning to create new offers, it’s a good idea to take a look at whether you’re doing anything that could prevent clients choosing to work with you. Five Reasons Why Clients Won’t Be Hiring You* is a great article that highlights some of the key reasons initial interest doesn’t turn into paying work. It’s a good place to start because a large percentage of irresistibility is simply professionalism – the more professional we look, sound and act, the more clients are likely to be attracted to working with us. Crunch the numbers – there’s no point offering a fantastic service if it’s costing you money. While the IFO (Irresistible Free Offer) is a fantastic gimmick, it doesn’t work as a long-term strategy, so be sure that you’re not underselling yourself. Looking at the lifetime value of a client is important; Do you know what your average customer spends with you? If so, you have a better idea of what you can afford to spend to gain one. If your company is growing and expanding, see where you might benefit by offering something now that will pay dividends later, but don’t trap yourself in a treadmill of mundane tasks at a cut rate. Get emotional – clients love their businesses and when you’re enthusiastic about their company, they respond positively. It’s easy to slip into a professionally smooth persona that doesn’t get excited but clients often want to be able to share their successes with their VA, especially if they’re in the start-up phase. Your honest pleasure when things go well for them is the best entrée to pitching an up-sell that works for both of you. So when a client tells you they’ve increased orders or gained a new contract, drop them a congratulations card and follow it up with a proposal showing how you can help them capitalise on their success. Be specific – you’re a unique person with a unique offering. Maybe you have unparalleled experience of the shipping industry or maybe you’ve got twenty years experience of logistics. Whatever your niche, be very clear what you bring that nobody else can. Client loyalty is built on delivery so you’ve got to be able to fulfil your offers, but client interest is created by identifying what the client needs and how you’re equipped to supply it. Don’t be scared to talk to clients about how you could help in areas where they’re not already using you – part of the service a VA offers is to see where VA skills could free up the client to do other work that will benefit them by growing their business. When they grow, you do too! This is up-selling with a purpose and it’s mutually beneficial. Remember that every offer needs a cut off point, so that you can re-evaluate it and see whether it worked for you or not. Deadlines are vital in allowing us to step back and assess whether our offerings are succeeding, and they create a sense of urgency that can persuade a client to commit. If you use our four point plan to craft your client offerings, you’ll make them more personal, more realistic and more exciting – and that adds up to irresistibility. Previous articleHow effective is your shop window?